Olympic Cyclist Dies After Being Hit By Taxi In South Africa : The Two-Way Burry Stander, one of the world's elite mountain bikers, was killed Thursday as he rode his bike in his native South Africa. Stander, 25, a two-time Olympian who placed fifth in his event at the London 2012 Olympics, was reportedly struck by a taxi van as he rode near his home in Shelley Beach. 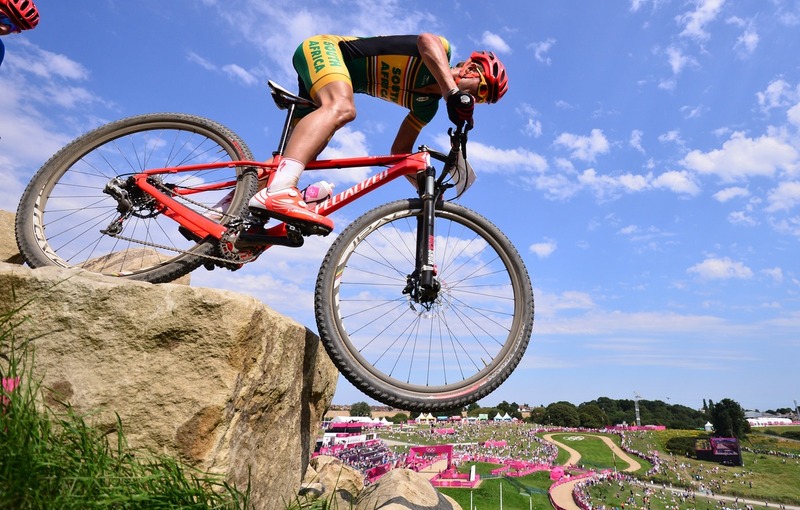 South African cyclist Burry Stander, seen here riding in the cross-country mountain bike race at the London Olympics, was killed during a training ride Thursday in South Africa. Burry Stander, one of the world's elite mountain bikers, was killed Thursday as he rode his bike in his native South Africa. Stander, 25, a two-time Olympian who placed fifth in his event at the London 2012 Olympics, was reportedly struck by a taxi van as he trained near his home in Shelley Beach, on South Africa's southeastern coast. The close proximity of the accident to his childhood home apparently allowed Stander's family members, reportedly including his wife, mother and father, to arrive at the scene quickly. "No parent should ever have to see his child lying on a tarred road after an accident, knowing that there is absolutely nothing he can do to save his life," said his father, Charles Stander, in a statement released Friday. "It is definitely the worst moment of my life. Words cannot even begin to describe how one feels when it happens. It was terrible." As someone who competed on the international stage from an early age, the news of Stander's death brought both sadness and tributes from his teammates, cyclists, and athletes in South Africa and beyond. The list included famed South African runner Oscar Pistorius, who said on Twitter that he was "absolutely devastated by the tragic news of Burry Stander's Passing. A South African Icon and sporting great." "The news reached teammate Todd Wells, who met Stander when the South African came to the United States as a junior, early Thursday. Wells recalled a young Stander winning a junior race in Snowmass, Colorado, by 15 minutes. Stander soon joined Wells at GT, 'and we've been great friends ever since,' Wells told VeloNews. 'We traveled the world together. We shared a lot of great success and failure. He was kind of this young punk kid from South Africa. But right from the beginning we just got along great.'" In addition to representing his country at two Olympics, Stander won several international titles, including the men's cross country race at the 2012 Windham World Cup in New York. The taxi driver whose vehicle struck Stander remained at the scene and spoke with police. According to reports, the accident happened after his taxi van made a turn; the driver had not seen Stander. No charges have been filed against the driver, but the Stander family's statement and other reports say the police have classified their investigation as one of "culpable homicide." Across South Africa, cyclists are planning group rides to honor Sanders. The late athlete's Facebook page includes tributes, as well as news of a memorial ride to be held next week. And Stander's father also urged riders not to "let their emotions get the best of them," according to the family's statement. "This is the last thing that Burry would have wanted," he said. As the AP and others are reporting, Stander is the second elite South African cyclist to die on the country's roads in the past two years — Carla Swart died in January 2011, after being hit by a truck.